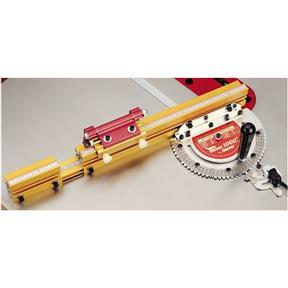 Continuing its well respected tradition of "making accuracy easy", INCRA® has added the MITER1000™ Incremental Miter Gauge to compliment its incredibly popular MITER2000™. 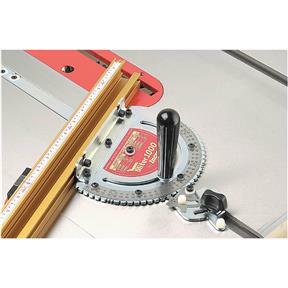 This model features INCRA's exclusive AngleLOCK™ Indexed Positioning that locks in miter fence angles in remarkably accurate and repeatable 5 degree, 1 degree of 1/2 degree increments over a range of up to 180 degrees, with continuous adjustability in between. Features INCRA's Incremental "Flip" ShopStop Positioner. It also uses INCRA's patent pending solid steel GlideLOCK™ Miter Bar, that uses up to eight expansion points to adjust both sides of the bar for zero side play with anti-friction travel in any standard (or near standard) miter slot. This means that all of that accuracy in the AngleLOCK™ Miter Head can actually be put to use because the bar won't wiggle in the slot. The result? You get perfect, gap-free hairline glue joints on all mitered corners without trial and error setups. If that sounds too good to be true, just remember INCRA's motto: EXACTLY AS PROMISED! And they mean it! I have only made a few cuts, but boy were they exactly the same length! This is a substantial tool. Sometimes you know a fine tool when you first handle it. Well, when I unboxed it I thought this thing is going to be geat -- and I was right. The instruction manual was very good with illustrating with color photographs and text explaining setup and how to make cuts. This tool works great with my new Grizzly G0715P saw. Highly recommend this tool. My only regret is I didn't buy it years ago. In baseball parlance this tool by Incra is a grand slam.